This page is the third in a series here we build a multicompartment cell and evolve it into a network of cells running on a parallel machine. In this page, we build a ring network of ball-and-stick cells created in the previous page. In this case, we make N cells where cell n makes an excitatory synapse onto cell n + 1 and the last, Nth cell in the network projects to the first cell. We will drive the first cell and visualize the spikes of the network. """Set soma, dendrite, and time recording vectors on the cell. :param cell: Cell to record from. 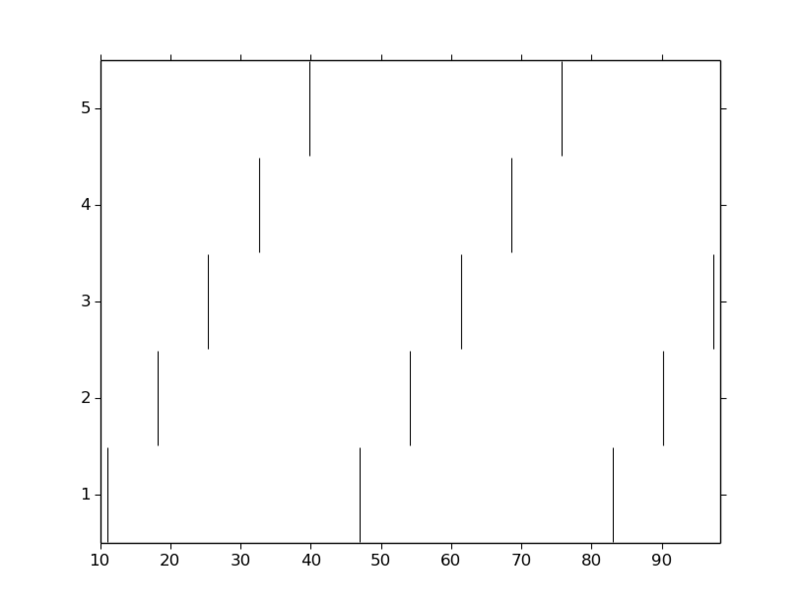 :return: the soma, dendrite, and time vectors as a tuple. """Initialize and run a simulation. :param tstop: Duration of the simulation. :param soma_v_vec: Membrane potential vector at the soma. :param dend_v_vec: Membrane potential vector at the dendrite. Now let’s begin our session. The first thing we will do is pull in our necessary imports. a dendrite with passive properties.""" """Create the sections of the cell.""" """Connect the sections of the cell to build a tree.""" """Set the 3D geometry of the cell.""" self.shape_3D()    #### Was h.define_shape(), now we do it. """Assign the membrane properties across the cell.""" for sec in self.all: # 'all' exists in parent object. """Build subset lists. For now we define 'all'.""" Set the default shape of the cell in 3D coordinates. parts of the cell relative to that location. """Rotate the cell about the Z axis.""" We want to construct an arbitrary number of cells and lay them out in a circle. The following code makes a list of N cells. With each cell, it first rotates it about the origin and then places its center at a location along the circle on the XY plane. # the dendrite extends along the X-axis. # First, at the origin, rotate about Z. Okay, we have our ball-and-stick cells arranged in a ring. Let’s now stimulate a cell and see that it is alive. Instead of stimulating with a current electrode as we did before, let’s assign a virtual synapse so that we get acquainted with driving the cells through synaptic events. Event-based communication between objects in NEURON takes place via network connection objects call NetCons. Each NetCon has a source and target, where the source is typically a spike threshold detector. When a spike is detected, the NetCon sends a message to a target, usually a synapse on a postsynaptic cell. A NetStim is a spike generator that can be used as the source in a NetCon, behaving as external input onto the synapse of a target cell. 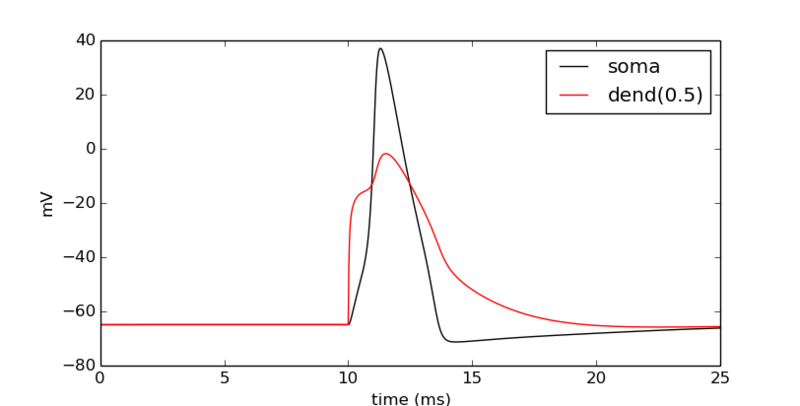 The following code makes a NetStim object that generates one spike at time t=9. 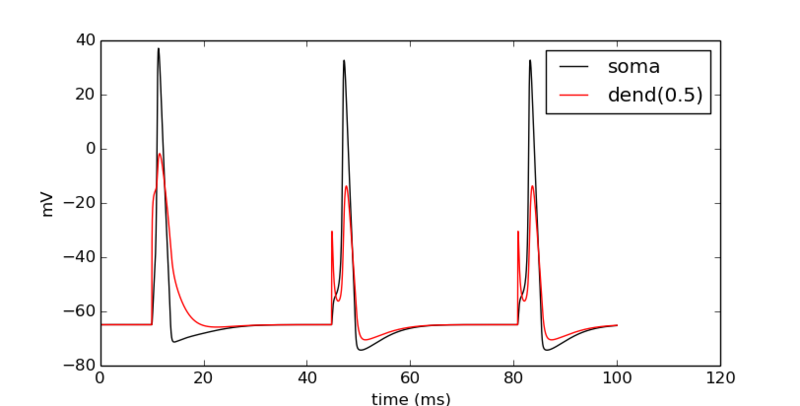 The NetCon then adds another ms delay to deliver a synaptic event at time t=10 onto the first cell. The code below makes a stimulator and attaches it to a synapse object (ExpSyn) that behaves much like an AMPA synapse – it conducts current as a decaying exponential function. ncstim.weight = 0.04 # NetCon weight is a vector. Let’s change the tau to decay by 2 ms.
We can see syn_’s properties. Let’s visualize the results of a simulation. How might we view the synaptic conductance during the simulation? 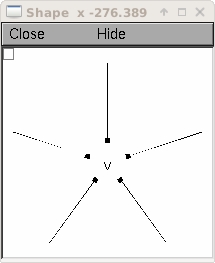 Try setting the recording vectors to one of the other cells. They should be unresponsive to the stimulus. Okay. We have our ball-and-stick cells arranged in a ring, and we’ve attached a stimulus onto the first cell. Next, we need to connect an axon from cell n to a synapse at the middle of the dendrite on cell n + 1. For this model, the particular dynamics of the axons do not need to be explicitly modeled. 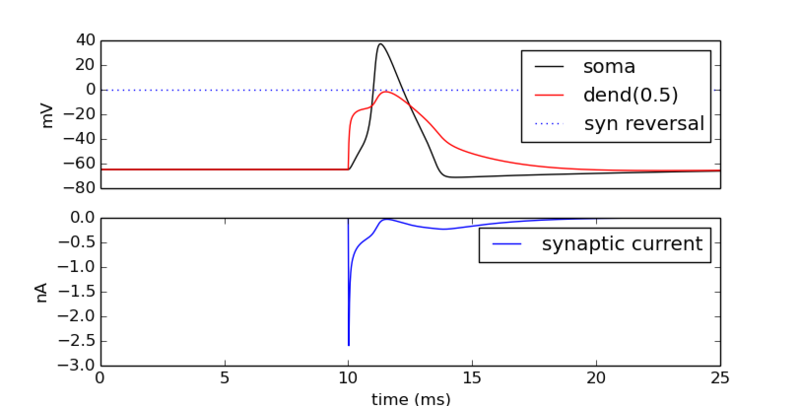 When the soma fires an action potential, we assume the spike propagates down the axon and induces a synaptic event onto the dendrite of the target cell with some delay. We can therefore connect a spike detector in the soma of the presynaptic cell that triggers a synaptic event in the target cell via a NetCon. Confirm that we get results. Try this again with a different cell instead of cells (i.e. try cells through cells[N - 1]). We can see that the network is now active – an initial trigger generates a spike in the first cell, which generates a spike in the second cell, etc., looping on and on. One thing that we did not do was record all of the spike times. Let’s do that with NetCon.record(). Each line represents one cell and lists all the times it fires: cell 0 fires first, then 1, 2, 3, 4, back to 0, etc. This page has demonstrated various functionality to arrange, connect, and visualize a network and its output. As nice as it may seem, it needs some design work to make it flexible. The next part of the tutorial further organizes the functionality into more classes to make it more easily extended. © Copyright 2010-2018, Tom McTavish, Robert A McDougal, N. Ted Carnevale, Michael L Hines. Created using Sphinx 1.6.6.